A whirlwind of activity stretched across Upper Iowa University’s Fayette Campus today (Wednesday, August 23) as students began to return for the start of the 2017-18 school year. 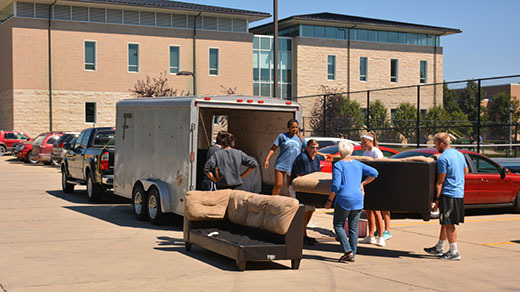 A mass of volunteers welcomed freshmen students to Fayette and helped them move into their residence halls. Dubbed the Peacock Experience, three additional days of events, orientation, and entertainment will follow. Classes officially begin on UIU’s Fayette Campus, each of its 25 U.S. education centers, Malaysia and Hong Kong locations, and online Monday, August 28. Additional photos of the Peacock Experience can be viewed on UIU’s Facebook or Flickr pages.